DESCRIPTION This beautiful 2 bedroom/2 bathroom condo is in the perfect location steps from 17th avenue! This corner unit has a dream kitchen with white and dark soft close cabinets, quartz counter tops, large island, stainless steel appliances, a wine fridge and has an open concept living and dining room. There is a large master bedroom with double closets and an ensuite with double sinks. The second bedroom is a good size that also has an ensuite and double closets. 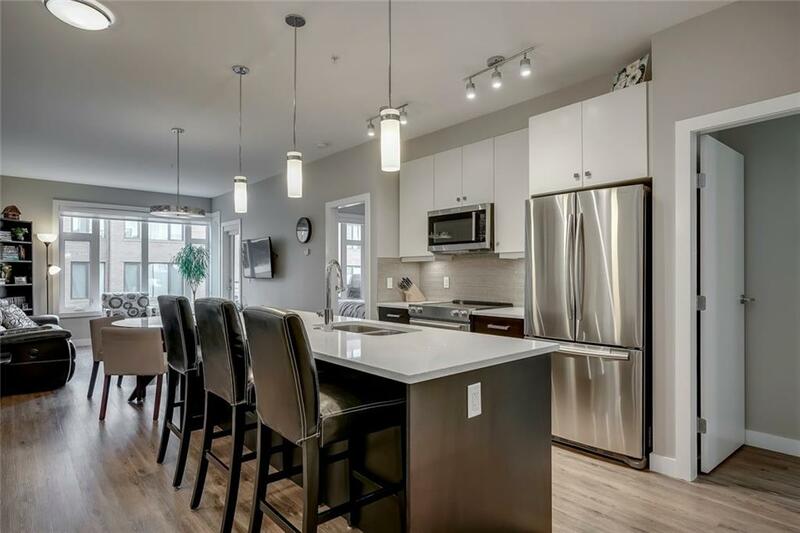 Additional features include 9ft ceilings, radiant in-floor heating, wide plank flooring, private balcony with a gas bbq hook up, quiet unit, great natural light and has been very well maintained! There is in-suite laundry, a storage locker and a titled parking spot in the secured underground heated parking lot! The building is one of the few newer builds (2015) conveniently located in Lower Mount Royal near 17th avenue restaurants and shops! Walk, transit or bike to work and enjoy this stunning home!